Description: Sexes similar. Mottled brownish-gray above and below; belly is white. Fairly long, heavy bill; long gray legs. In flight, shows a distinctive black and white wing pattern. Winter plumage is uniformly gray above and white below. 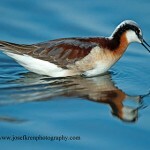 Habitat: Breeding birds use a variety of wetland habitats, such as streams, ponds, and marshes. Prefer habitats with nearby prairie vegetation. 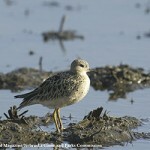 Where in Nebraska: Uncommon to locally common spring and fall migrant across the state. 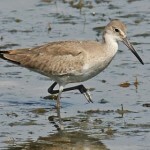 Locally common summer resident and breeder in the Sandhills. Field Notes: Sandhills of Nebraska appear to be the southern limits of breeding in all of the Plains states. 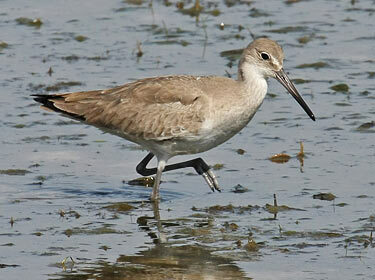 Fun Facts: The Willet is a type of sandpiper and is the only sandpiper in North America whose breeding range extends all the way into the tropics.